Charcuterie is French in origin but there are no rules to create fun appetizers to pair with your favorite wine. This was a joy creating for everyone. Artfully design and arrange your savory flavors on beautiful wooden platters; create splashes of color with bowls that hold nuts, olives or spreads and enjoy time together. Our Charcuterie Holiday event was inspired by The Magnolia Journal. The fun of pairing the cheeses from Holland, Italy and France started with the Cranberry Orange Salsa made with our Blood Orange Fused Olive Oil, Walnut Green Bean Spread showcasing the Wild Mushroom Sage Infused Olive Oil, sweet treats; Ozou White Chocolate Baklava Bark with Blood Orange Fused Olive Oil and Dark Chocolate Truffles made with Limonata Fused Olive Oil and Raspberry Aged Balsamic. My trip to the Cheese Shop in Essex CT was full of creative ideas. What fun learning from the knowledgeable team member there. The wine needed to be balanced for the savory and sweet flavors I chose a red wine from Piedmont Italy, called Mariaia – Marachesi Barolo which complemented the palate. Cheeses from Holland – Ewephoria and Polder Goat Gouda that went well with the Black Mission Fig Balsamic drizzle, Asian Pears, Papaya and Cranberry Orange Salsa. Italian cheese: Crucolo was divine alone or with a drizzle of Baklouti Green Chile Fused Olive Oil and Marcona Spanish Almonds. France – Chaumes cheese was exceptional with the crusty bread and a small thin slice of red onion, alongside of the almonds and pistachios. The Finnocchiona meat with fennel was perfect with any of the cheeses. Serve an artisan crusty bread to add to the cheeses and meats. The nuts were Spanish Marcona Almonds, Pistachios, Pecans that I roasted with our Maple Balsamic Vinegar. We also had organic Turkish Figs and California Apricots. The fresh fruit was Asian Pears and Papaya – fresh Persimmons are great also. 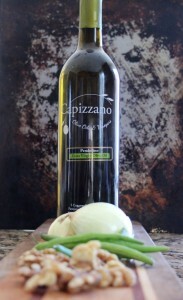 Our exceptional whole queen olives were a perfect addition to the table. 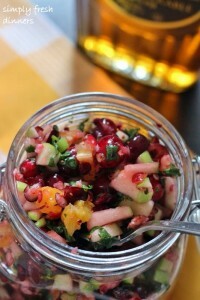 The shrub drink was made with our Sicilian Lemon White Balsamic, Just Cranberry juice (no sugar) and sparkling water. There are so many ways to present the Charcuterie creating your own masterpiece. 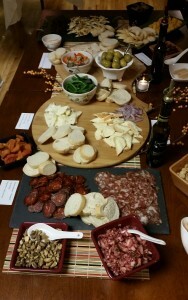 At Capizzano Olive Oils & Vinegars our “Charcuterie Designer” will help you create your own unique Charcuterie Board that your guests will remember. Decorate with vibrant colors on the table using bowls to make a statement. With planning and preparation beforehand you’ll spend more time with family and friends instead of being in the kitchen. Thank you for enjoying this wonderful event together. A clean fresh salsa for crackers cheese on top of fish or by itself. A lot of color, flavor and texture to complement your menu. 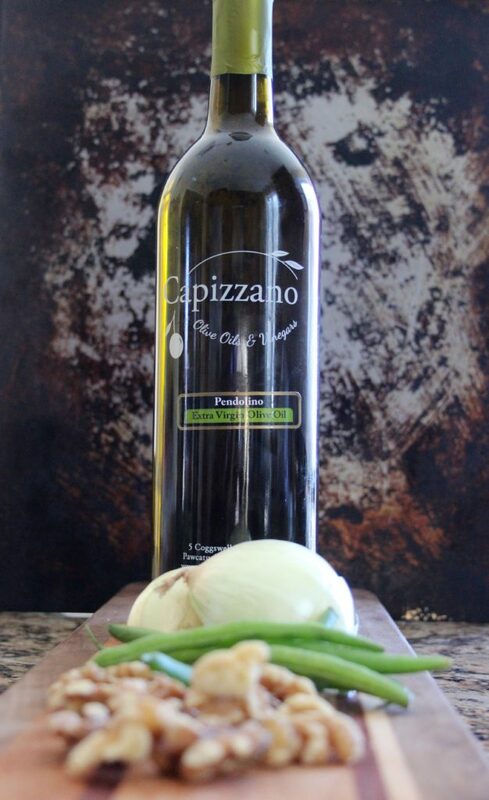 Adding Capizzano Olive Oils & Vinegars. Original recipe by Simply Fresh Dinners and photo credit. Put cranberries in food processor – pulse intermittently until chopped. Put chopped cranberries in a large bowl. Add maple syrup mix into cranberries stir well. Cover and let sit at room temperature for 1 hour letting flavors blend together. Test the flavor, you can add a bit more maple syrup if needed. 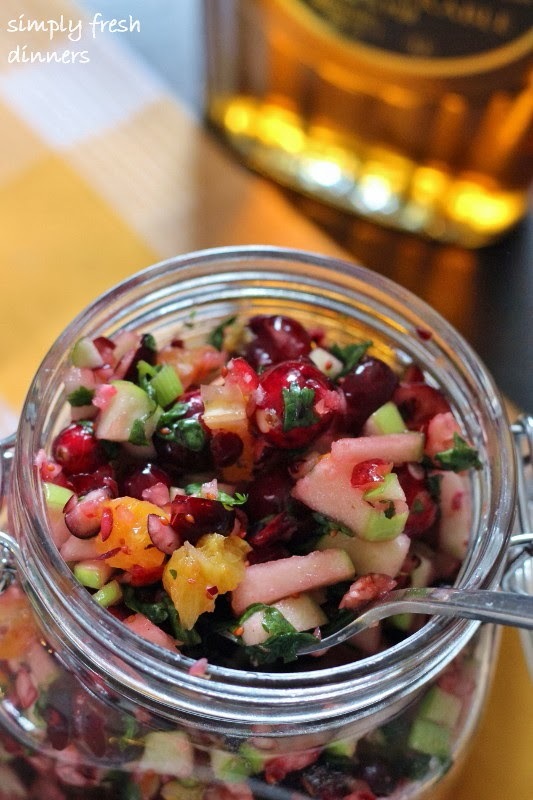 Combine remaining ingredients to cranberries and mix well. Chill for an hour before serving. Serve with crackers, cheeses, on top of fish or just by itself a wonderful complement to your menu. Mix can be made up to 3 days ahead. Note: I add the apples into my food processor and pulse into small chunks.